The winter sports resort of Megève was created in the inter-war period by a branch of the Rothschild family. The resort grew and in 1933 a cable car to Rochebrune was built. Three years later this allowed the resort to be connected to Mont d’Arbois. The first ski competition was created in 1914 and many pictures reflect this period of discovery and development. Farmers invented the ski-lifts, almost everything would be tested. A woman journalist would energize and illuminate the village through her texts; she was to become a ‘grand dame’ of Megève with her influence. Mathilde Maige-Lefournier was a mountaineer from Chambery. In November 1913 she wrote an article for the magazine The Mountain entitled “Megève or the glorification of ski” which glorified the ski sites of Mont d’Arbois and Rochebrune. One day she remarked to a hotel owner in the village, “I think Megève was created for skiing and skiing was invented for Megève.”: a spotlight which influenced and made the village, already a mecca for winter sports. The arrival of the Rothschild family in Mont d’ Arbois would accelerate the development of skiing in Megève. Village farmers invested in the Rochebrune sector, notably with the construction of the first cable car for use by skiers, the famous “red bucket” in 1933. In 1923 it was the birth of the Megève Sports Club which saw great champions emerge. Emile Allais, a native son of Megève, was a triple medallist at the World Ski Championships in Chamonix in 1937. The famous Aallard stretch ski-pant was invented in 1930. This dynamism made ​​the resort famous and its rise was meteoric. Two hours from Lyon lies the most authentic mountain village in the Alps. Skiing in Megève is 445 kms of slopes in an exceptional setting, but not only this: gastronomy, events, shopping and relaxing in the paradise of ‘après-ski’ nestled in the heart of the Mont Blanc Region. Come and experience the unparalleled skiing in an area that combines slopes, forest, alpine farms and sunny terraces on several mountain ranges. Suitable for families who find Megève’s gentle slopes reassuring to have fun with the kids. Lovers of the great outdoors will prefer the Cote 2000 mountain range which enjoys good snow thanks to its exposure. Freestyle fans are not left out with a dedicated area that allows them to jump safely onto a giant air bag. You’ll soon understand that in Megève a ski paradise awaits you at just 180 kms from Lyon. 600 km from Paris . Paris – Sallanches : A6 + A40 . Calais / Paris / Macon / Annecy / Sallanches : A26 + A1 + A6 + A40 . Lyon / Chambéry / Annecy / Sallanches : A43 + A41 + A40 . 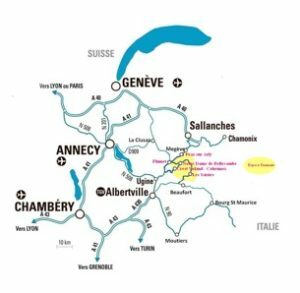 Lyon / Chambéry / Albertville : A43 + A430 . Geneva / Sallanches : A40 . Direct TGV during the weekends in winter. Frequent bus service to transfer from Sallanches . Open daily (except Sundays during school holidays) from 9:10am to 12pm and 2pm to 6.10pm. Off season: open only on Fridays from 9:10am to 12pm and 2pm to 6.10pm. International flights, 87 km from Megève. How summer camps prepare kids for college? What do we do when we’re not at camp? Tell us if you saw us? WHY SEND MY CHILD TO A SUMMER CAMP?